I have taken Bone Strength Take Care by NewChapter for years. The Best! Bone Strenght Take Care from NewChapter is a very good product. I like it a lot! This is a highly absorbable calcium and doesnt make one constipated. Easy to swallow too. Many people think that all calcium supplements are created equal. The truth is that the most common form of calcium supplement today is derived from limestone or rock. 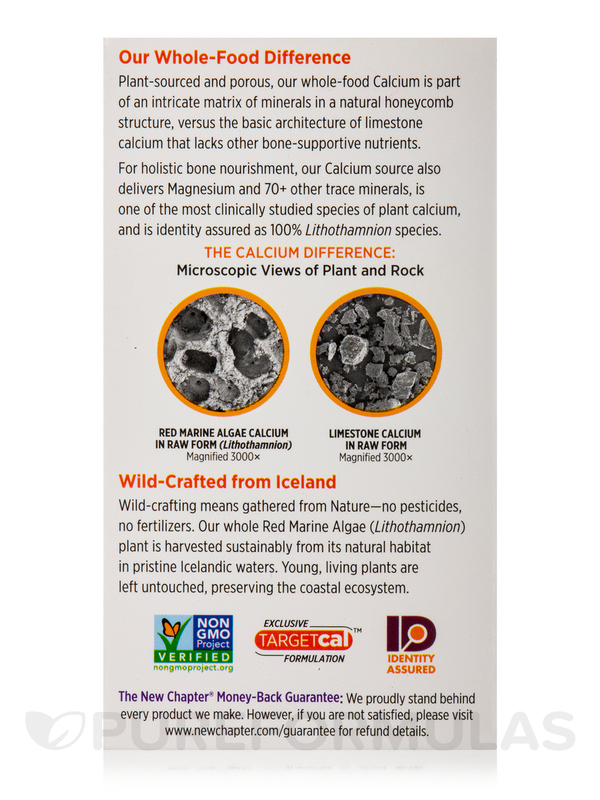 We don’t eat rocks as part of our balanced diet‚ so why would we choose to supplement our bone health nutritional needs with limestone? Our bodies understand and seek whole food sources of nutrition. That’s why New Chapter formulated Bone Strength Take Care with a whole-food plant source of calcium‚ magnesium‚ and other important trace minerals. 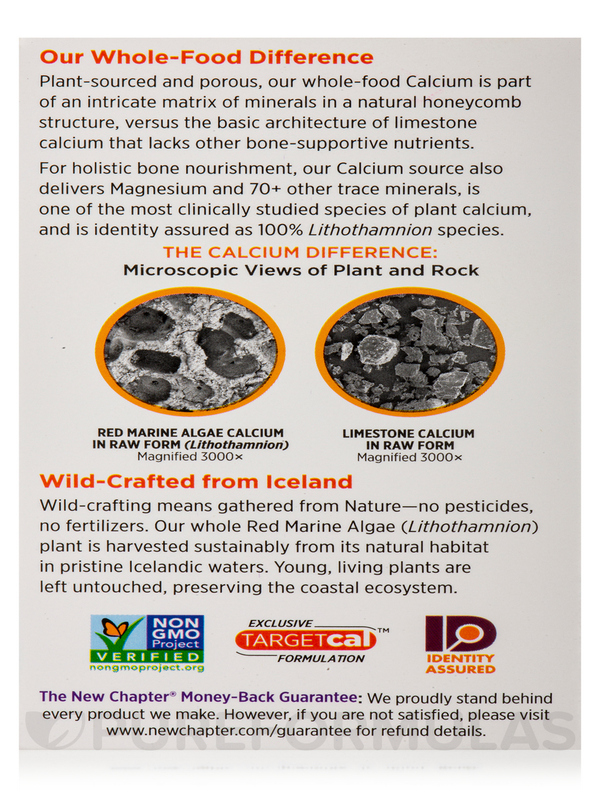 The calcium complex in Bone Strength Take Care is derived from a specific plant form called Lithothamnion Calcareum‚ sustainably harvested from pristine shores along the Icelandic coastline. Much like organic vegetables‚ this sea plant is allowed to mature naturally and then sustainably harvested to deliver its optimal nutritional value. Calcium must be completely dissolved in order to be absorbed. The plant-based calcium found in Bone Strength Take Care grows in a honeycomb structure and is extremely porous‚ which dramatically increases the calcium’s surface area. Stomach acid can then come into greater contact with the calcium‚ making it easy to dissolve. Calcium carbonate sourced from limestone has a much smaller‚ rocky surface area and is more difficult to dissolve. According to the National Institutes of Health‚ many people don’t get enough calcium from their diet‚ suggesting supplementation as an alternative to meet their daily required intake. Despite this dietary deficit‚ emerging research suggests that isolated calcium supplementation can increase cardiovascular risk. Calcium supplementation alone is risky because calcium requires other nutrients to be properly utilized. The “calcium paradox” holds that without adequate Vitamin K‚ calcium will not be deposited in the bones where it is required for maintaining bone strength‚ but rather in the arteries and soft tissues where it can cause stiffening. It is therefore crucial that an effective bone health supplement be formulated with the necessary nutrients and minerals to ensure the optimal utilization of calcium. 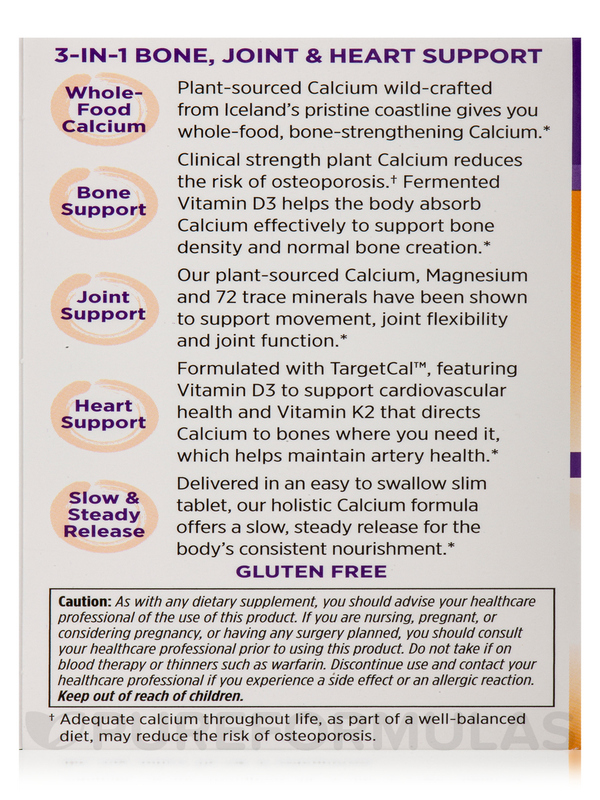 TargetCal provides a highly bioavailable‚ bioactive‚ and long-lasting form of natural Vitamin K2 (MK-7). Vitamin K2 is the most active form of Vitamin K in bones and arteries. This key nutrient helps put calcium into our bones where we need it‚ and helps keep calcium out of our arteries‚ where we don’t. Vitamin K2 (MK-7)‚ sourced from fermented whole food‚ gently redirects “lost” calcium back into the bone bank. In addition to the primary benefit of promoting bone health‚ the ingredients in Bone Strength Take Care also provide other health benefits — including joint‚ cardiovascular‚ and eye health. The plant-source of calcium found in Bone Strength Take Care has been shown to significantly promote joint health in a placebo-controlled human clinical trial. Whole-Food Vitamins D3 and K1‚ along with Natural Vitamin K2 and Calcium have been shown to promote numerous components of cardiovascular health. Whole-food Vitamin D3 provides many other benefits including eye‚ immune‚ digestive‚ and respiratory health. 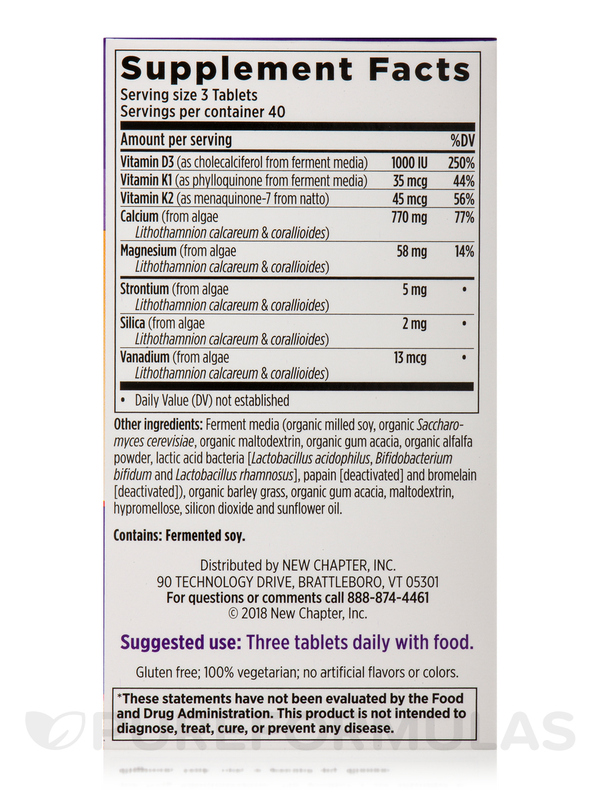 Take 3 tablets with 8 oz. of water in the middle of a larger meal. For best results‚ take one tablet with lunch and two tablets with dinner daily. For use with children or if you are nursing‚ pregnant‚ considering pregnancy‚ or taking Coumadin/Warfarin‚ you should consult your health care practitioner prior to using this product. I use this Bone Strength Take Care Slim Tabs by NewChapter when traveling as it has multiple bone supplements in it and I don't have to take different pills with me. I loved taking Bone Strength Take Care Slim Tabs by NewChapter but switched to other products based on my Nutritionist's recommendation. I would not hesitate to take it again if/when the opportunity arises. 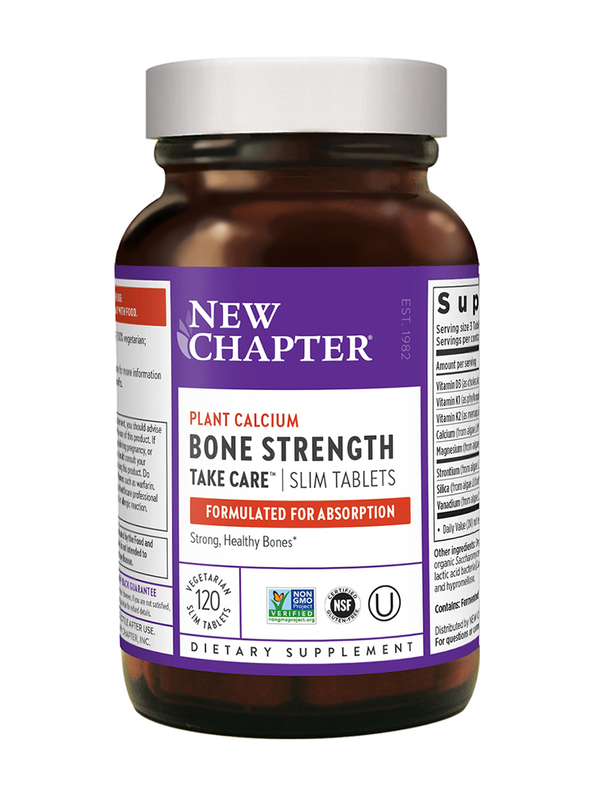 Can't say enough good things about this Bone Strength Take Care Slim Tabs by NewChapter product! A simply amazing way to get calcium! 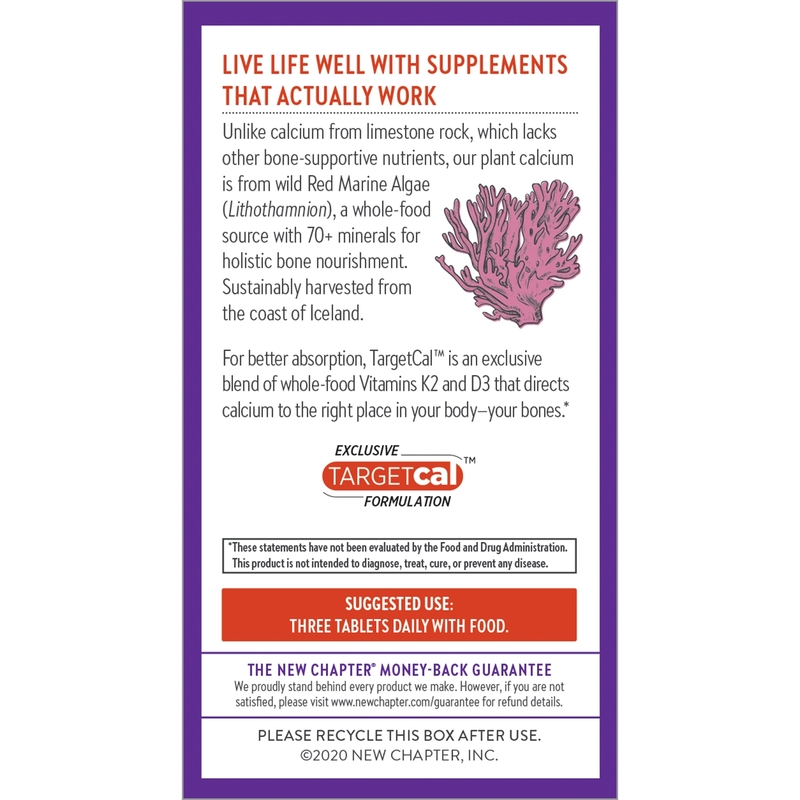 Love that the calcium comes from algae! 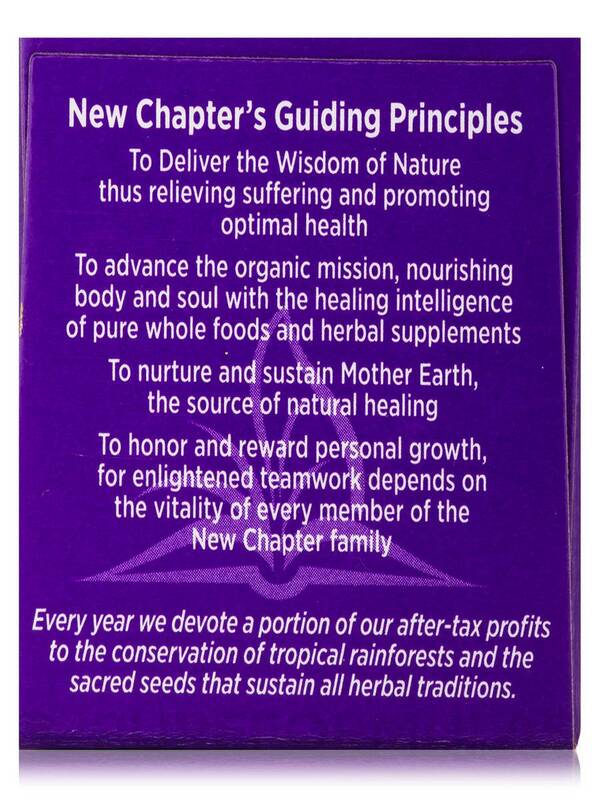 I use other NewChapter -Purity supplements aside of this Bone Strength Take Care by NewChapter. 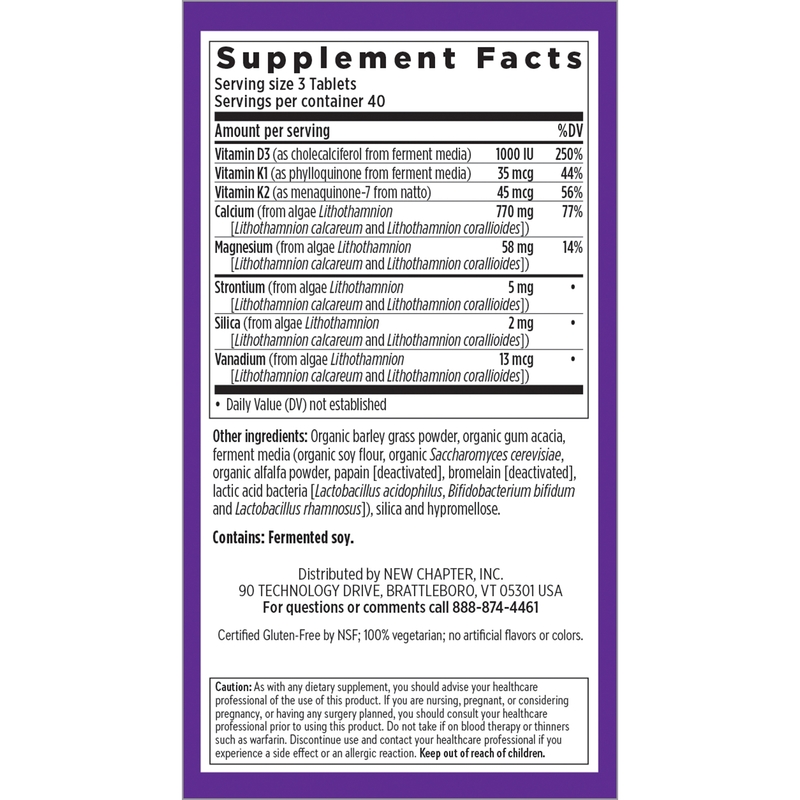 Calcium-Magnesium ratio is not 1:1 . Magnesium is not stored, as in excess calcium which can be deposited in other body parts. Dr Oz said we get too much Ca in foods already. Bone density scans showed considerable improvement after only 6 months of taking Bone Strength Take Care by NewChapter. 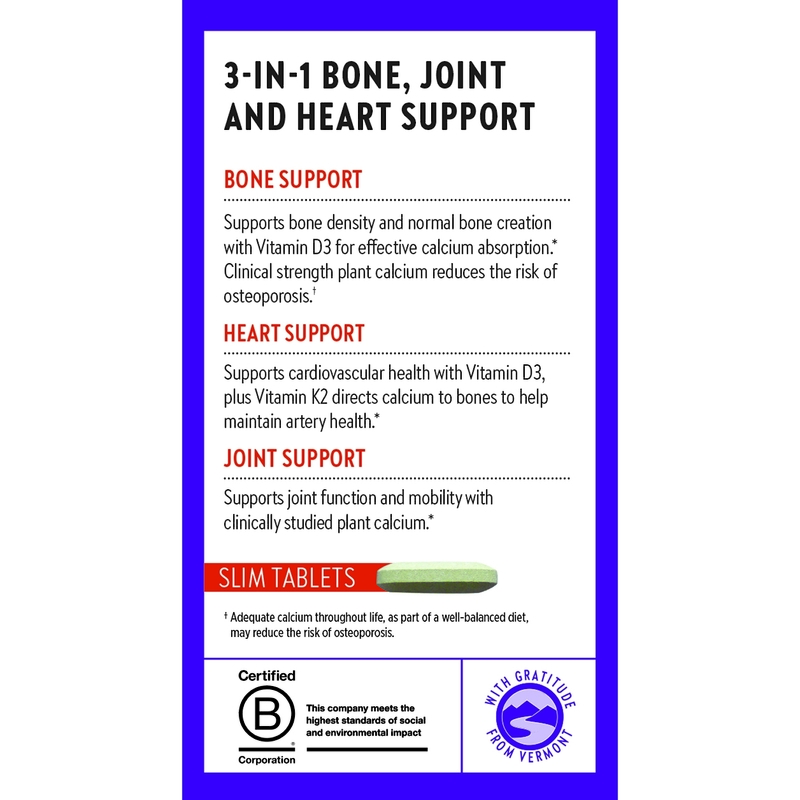 This product improved bone density. I'm so happy with product! I'm so happy to have found Bone Strength Take Care by NewChapter. My stomach can tolerate! Bone strength gives good results! 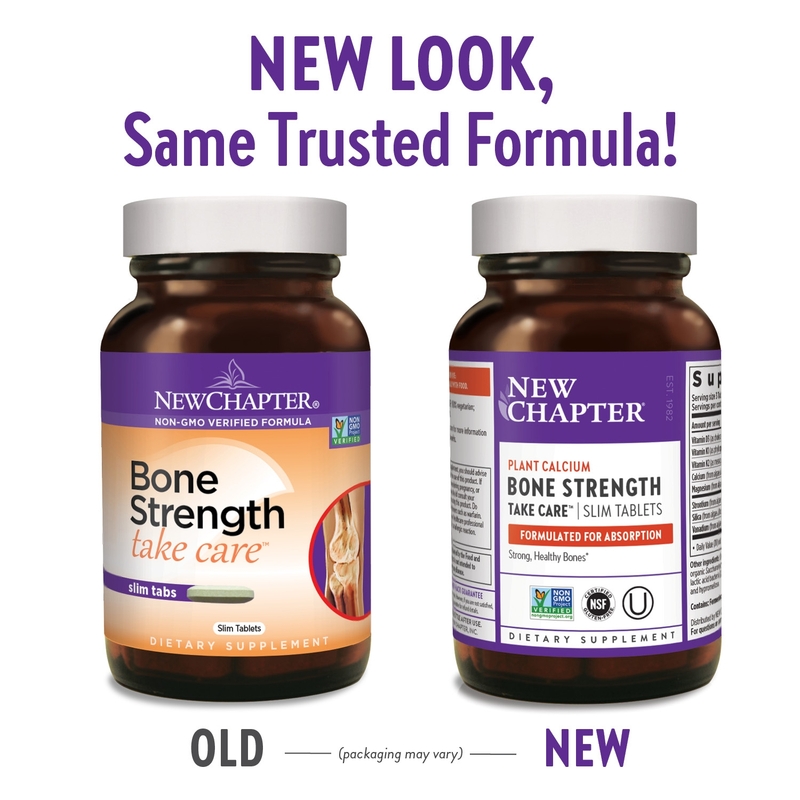 I have used Bone Strength Take Care by NewChapter for 2 years and have had good results. 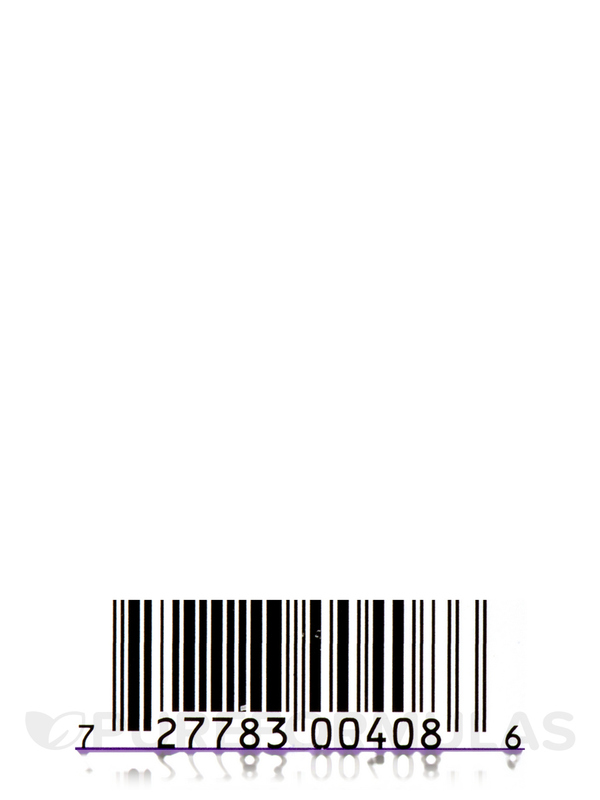 I ordered from Pure Formulas as they ship quickly and price is much better. Very convenient to order on line. Easy on my stomach and has helped with positive results! It is plant sourced calcium and easier for the body to absorb readily. 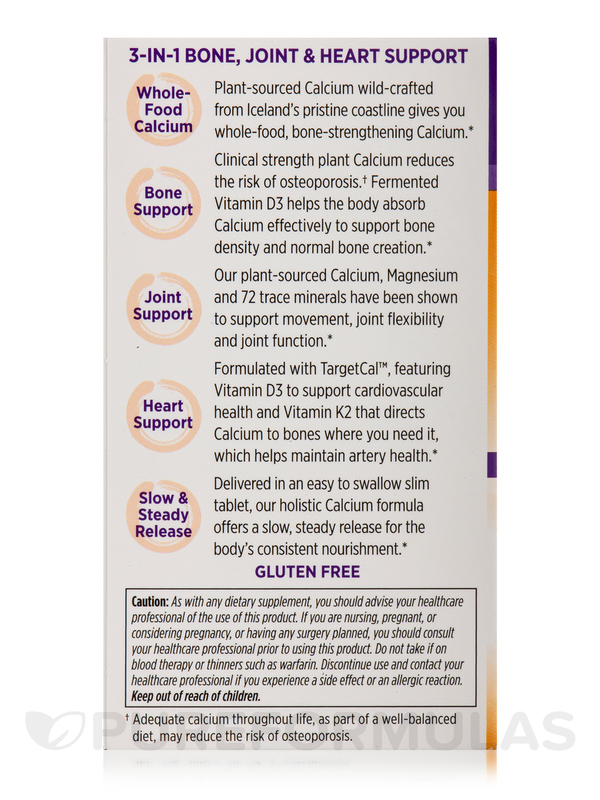 Bone Strength Take Care by NewChapter contains calcium from algae that works! From what I understand, this is the most absorbable.